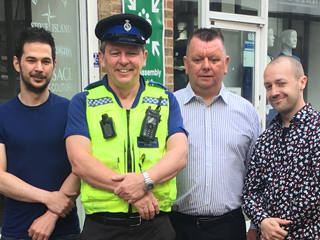 Watford Business Against Crime (WBAC) is an information sharing scheme which aims to reduce retail crime and anti-social behaviour throughout Watford town centre. Watford BID has been running the scheme since April 2017, after it transferred over from the Watford & West Herts Chamber of Commerce. John Hattingh is the WBAC Co-ordinator, employed by Watford BID and working alongside the town centre police team. His role is to collate information gathered from members and the police, which is then analysed to identify crime patterns and persistent retail offenders and those identified as ‘lifestyle criminals’. A radio link system is central to the WBAC scheme as it ensures that members are in direct and constant contact with each other, the CCTV centre and the Hertfordshire Police through nominated PCSOs and police officers who work in the town centre. The annual WBAC membership subscription is calculated according to the size of your work force, with discounts for businesses within the BID area and for charities. An annual fee is also charged for the rental of the radio system.